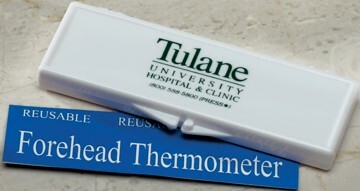 Custom Strip -Forehead Thermometers Personalized in Bulk. Promotional, Inexpensive. Lowest prices in USA, Canada. Bulk promotional forehead thermometer strip and instructions in white plastic case. This is a very handy reusable, travel or home health care thermometer for rapid temperature measurements. Free artwork design. We will send you a proof for your approval before production. Budget Prices in USA and Canada for wholesale personalized strip thermometers. American clients pay no taxes. Prices include your 1-color custom imprint on the plastic box. Optionally, the imprint may be done on the thermometer strip (see second photo). Add the amount shown for extra imprint colors. Size: 3 3/4" x 1 3/16"
Imprint Size: 3" x 4/4"
Reading in only 15 seconds! Reusable without sterilizing. Fahrenheit and Celsius readings.